The day began for us in the small hours, swimming towards a beautiful strawberry moon hanging low over the horizon and casting a carpet of light on the sea. 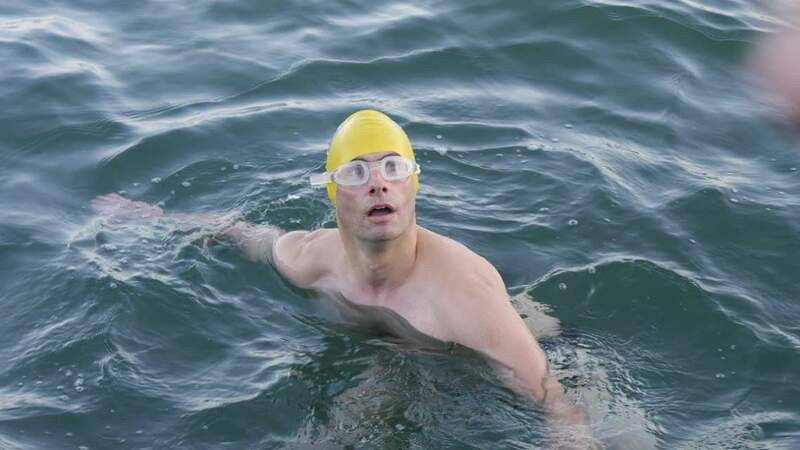 Theo began our journey, first heading back to shore to make a land start to the first hour’s swim. His swimmer’s lights twinkled in the inky water, while the pale cliffs of Dover loomed ghost-like through the half-light. 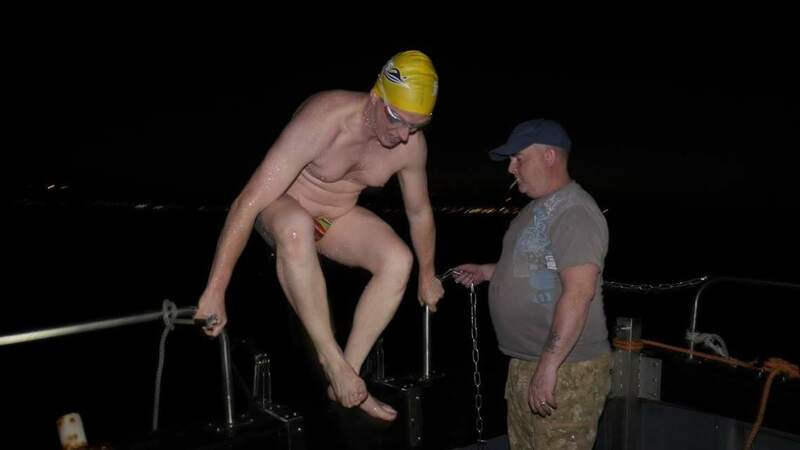 One hour in and my first shift began with a first taste of night-swimming. This is surprisingly lovely; the water was cool, calm and silky dark. 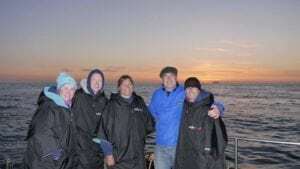 This was definitely my favourite section of the swim as I soon fell into a companionable rhythm alongside the Louise Jane, and eventually the horizon began to blush with an intense crimson as the sun started to rise. 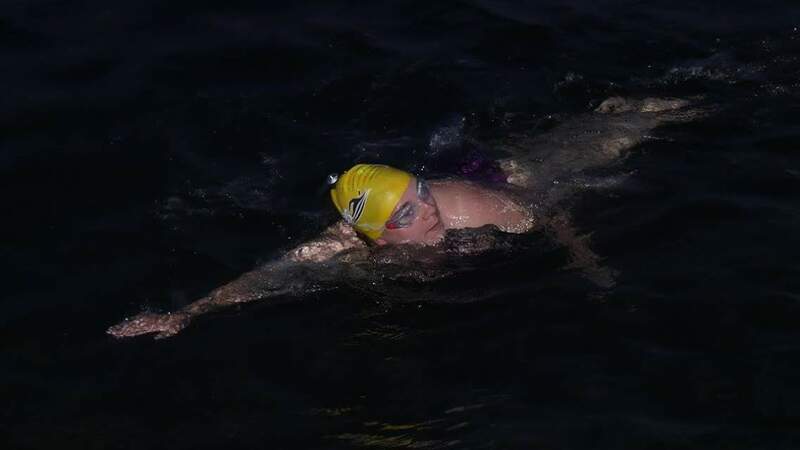 Next in the water was Nichola who brought us into daylight and for a while made a picturesque scene tracing a parallel course with a P&O ferry. By the time Izzy got in the sun was r ising on a perfect, calm, sky-blue day. On board we took turns waving and giving thumbs up to the current swimmer, while watching the hulking Channel traffic loom by, some of them great cities on water. The movement of the boat meant nausea was never too far away for any of us, but we managed to keep it in check. Richard was next up, taking us steadily into our fifth hour, the English coastline diminishing rapidly. 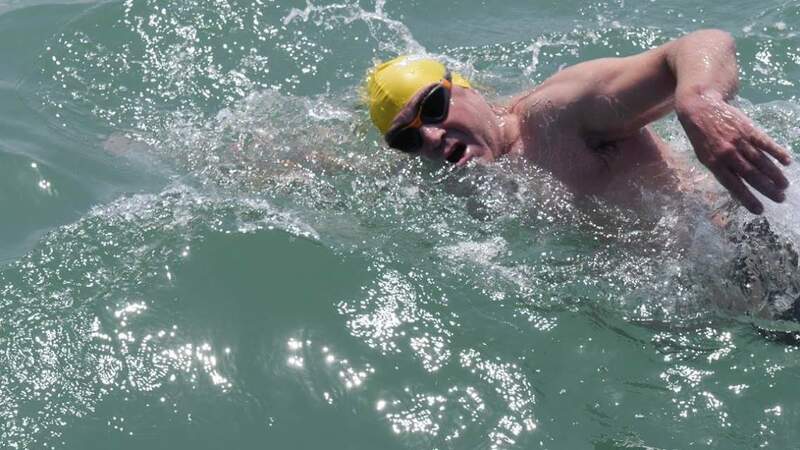 Paul then completed the first ‘round’, swimming against a fiercely bright rising sun. Andy and his crew were indefatigable in supplying us with endless cups of tea and words of encouragement. 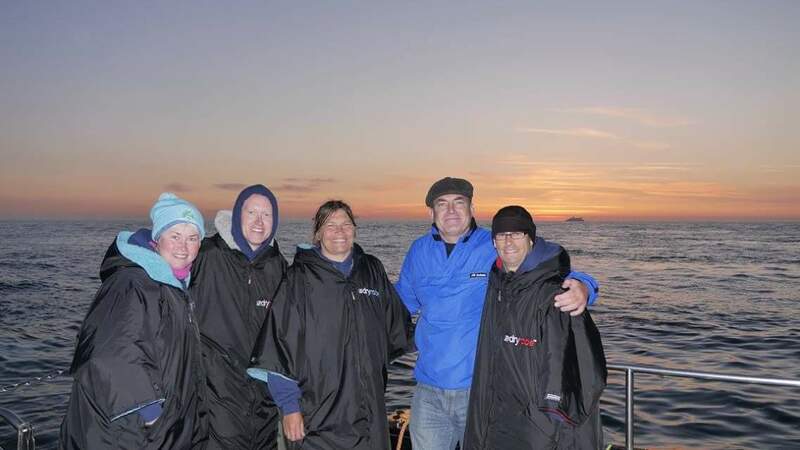 A second set of swims took us well across the Channel, with the French coastline becoming a more defined and tangible prospect on the horizon. 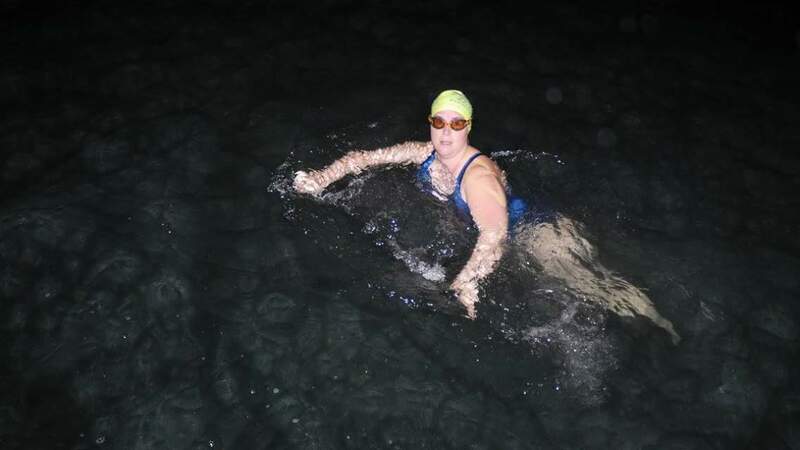 After 12 hours of steady and uneventful swimming we were hitting the home stretch and starting to catch the tide that would hopefully sweep us round towards our target, the ‘Gris Nez’ cape on the Cote d’Opale. But then in the last stages of our journey a weather front moved in from the east, whipping up the water with a ferocious intensity, throwing boat and swimmer about like toys. What might have been a short home run became three and a half more hours, reminding us just how fickle a mistress the Channel can be. 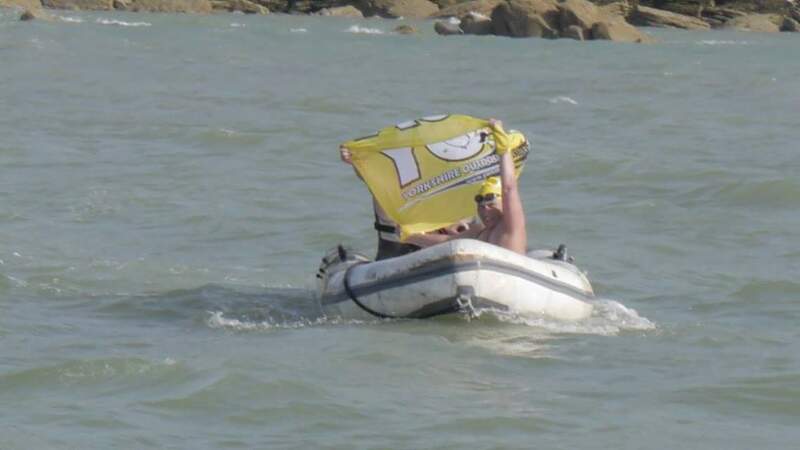 At last, with whoops of joy from the team, Izzy made it to shore and raised the YOS flag over French waters. 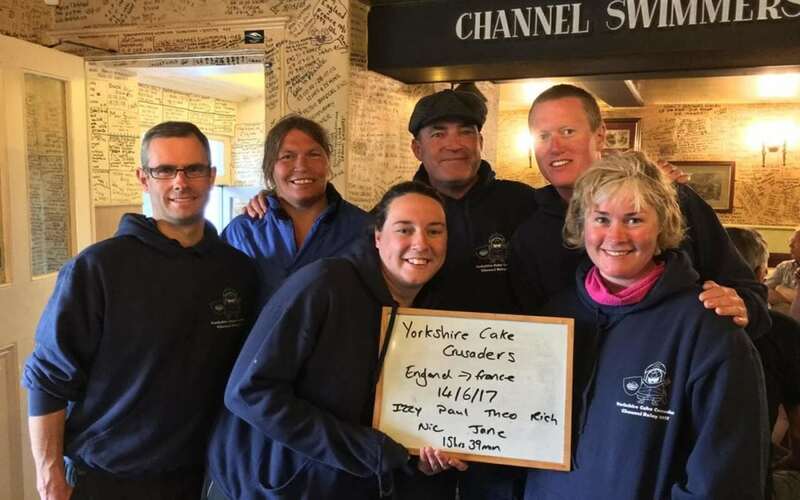 We headed back to England tired but with a real sense of accomplishment having pulled together as team, pitching mind and body against the elements, keeping the chain unbroken. Home to Sheffield and another Channel story to tell.